I had heard of the name of Massimo Vitali and understood he was an Italian photographer of beaches. And I had heard that he had been born in Como and had once said that “Life is a Beach”. Enigmatic enough. I had never heard of the name Vitali as being that of an elderly recluse painter living near Lake Como whose first name was Giancarlo. Giancarlo Vitali’ s painter son Velasco wrote me a letter saying that his father was to be celebrated in Milan after years of silence, and would I be curious to take a look. What had caught Velasco Vitali’s attention was a remark I had made in the introduction to a projection of a recent film I had made about Rembrandt. I had said something like it was a great melancholy that painters did not seem to talk to filmmakers and that filmmakers did not appear to speak to painters, that there was missing dialogue somewhere. Painters and filmmakers should, in every sense of the word, talk to one another, have a dialogue, many dialogues, exchange languages. Their business after all was looking and seeing and both could reap benefit. From 5 July to 24 September Giancarlo Vitali’s first anthological exhibit presents a critical reinterpretation of 70 years of his art: from the early works of the 1940s esteemed by Carrà, up to his last and unrevealed production. Together with his paintings from the 1980s and 1990s, extolled by Giovanni Testori, the exhibit displays a vast selection of never-before-seen finished works, engravings and drawings. The title is Time Out, still play. A moment to imagine a different game, a moment to evaluate the values in play and the pace of things. An uncritical pause for review. Time out is Giancarlo Vitali's painting time. Time Out is the first major exhibition of Giancarlo Vitali's work organized by the city of Milan. Curated by his son Velasco Vitali, an artist in his own right, the event is spread over different institutional venues to document a unique artistic trajectory in terms of development, geographical location and recognition. The survey offered of some seventy years of painting encompasses the early works of the 1940s, praised by Carlo Carrà, those of the 80s and 90s, admired by Giovanni Testori, and the most recent and previously unexhibited work. 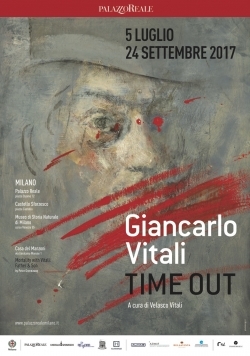 Giancarlo Vitali-Time Out is a journey that starts from the exhibition of over two hundred works in Palazzo Reale and involves the city as a whole with three supporting events held in the Sforza Castle, the Natural History Museum and the Manzoni House to offer a complete overview of the artist's career. The Sforza Castle presents a broad selection of the over 450 prints produced by Giancarlo Vitali since the 1980s. The space opens with an installation by Velasco Vitali that pays tribute to the ancient and amazing art of printing, a red carpet that invites us to wander through original copper plates, racks and tweezers. An entire chapter devoted to Antonio Stoppani, born in Lecco like Giancarlo Vitali, former director of the Museo di Storia Naturale, author of Il Bel Paese (1876) and tutelary divinity of an investigation of the natural landscape. One large painting and 14 drawings enter into dialogue with fossils from the permanent collection and conjure up a fanciful walk through the painting and countryside of Lombardy. 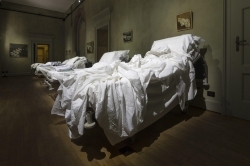 Peter Greenaway’s installation "Mortality with Vitali" draws on the natural wonders of Lake Como to transform the Manzoni House into a cabinet of curiosities. Greenaway links up with the literary world of Manzoni through Vitali’s painting in a unique setting finely balanced between the present and the past. At the exhibition site at Palazzo Reale, the artist's presence is witnessed in a short film about 20 minutes, shot with the artist in his studio in Bellano. An art documentary on Giancarlo Vitali, made in March 2017 by Francesco Clerici and produced by ArchiViVitali. The exhibition trail begins on the ground floor of Palazzo Reale with a bookshop/reading room specifically designed by Remembrance and open to exhibit visitors “Giancarlo Vitali. Time Out” and “Agnetti. A Cent’anni da adesso. " The exhibition is accompanied by a catalog published by Skira. The project and the outfits are edited by Studio C14; Special arrangements are signed by Alexander Bellman and Romeo Sozzi. “Giancarlo Vitali. Time Out” was realized thanks to Almag, Azimut Wealth Management, Bellavista, Torneria Automatico Alfredo Colombo and the partecipation of Broker Insurance Group, Paola d’Arcano, ParkHyatt Milano, Studio Borlenghi, Antiqua Pizzi e Ricami e Sartoria Teatrale Arrigo. At Casa del Manzoni the outfit was coordinated by Lo Scrittoio.